Doctors may soon be able to patch up damaged bones and joints anywhere in the body with a simple shot in the arm. 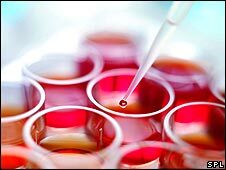 A team at Keele University is testing injectible stem cells that they say they can control with a magnet. Once injected these immature cells can be guided to precisely where their help is needed and encouraged to grow new cartilage and bone, work on mice shows. The aim is to treat patients with injuries and arthritis the UK National Stem Cell Network conference heard. Professor Alicia El Haj, working with Professor John Dobson, also of Keele University, says the technology, patented by Magnecell, could be tested in humans within five years. It would provide a way to treat disease without invasive surgery or powerful drugs. The injection would use the patient's own stem cells, harvested from their bone marrow. These mesenchymal cells would be treated in the lab to give them a coating of minute magnetic particles. These same magnetic nanoparticles are already approved in the US where they are routinely used as an agent to make MRI scans clearer to read. Targeted magnetic fields could then move the cells around the body to the desired place and switch them into action without the need for drugs or other biochemical triggers. Professor Al Haj said: "The ultimate aim is to repair cartilage and bone. We have been able to grow new bone in mice. Now we will look at whether we can repair damaged sites in goats. "We should be able to move to human trials within five years." Professor Jon Tobias of the Bone Research Society said: "Stem cells capable of regenerating diseased bones and joints can now been isolated and grown up outside the body, but the difficulty is in getting them to exactly the right place. "The technique developed by the team at Keele University, in which small magnetic particles are introduced into cells in the laboratory, represents an interesting approach to this problem, by raising the prospect of using magnets outside the body to manoeuvre cells into position." Meanwhile, experts at the University of Southampton, led by Professor Richard Oreffo, have treated four patients with hip joint problems using stem cell therapy. The technique combines the patients own bone marrow stem cells with donor bone cells to patch-repair damaged bones that would otherwise need treatment with metal plates and pins. They say it is only a matter of years before their method could be used routinely to treat some of the 60,000 people who fracture a hip in the UK each year.